"The Artist—Canyon Road Memories." 18x24 inches. Oil on stretched linen canvas. November is the time to be thankful, a time to remember and to embrace those who enrich our lives. I’m thankful for a lot of things, but I’m also thankful for You! 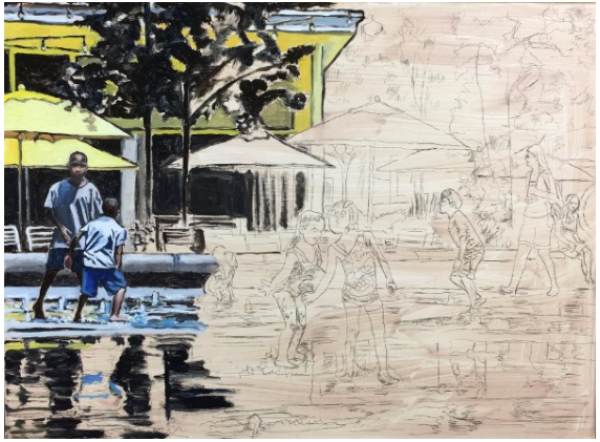 If you haven't seen "Dilworth Splash" on FB or, IG, thought you might like a glimpse of this current work-in-progress. I am happy so far. The little fountains of water and the reflection are a challenge, but I think I can do it! 8 Days and Counting! The "Give Better Gifts" 25% OFF Discount expires soon! TAKE 25% OFF anything on my website - from original paintings, to prints, to jewelry to marble coasters. All items on my site are 25% OFF through midnight Cyber Monday. Use promo code "GQJL1Z6" at checkout. This discount only applies to folks on my mailing list. So, you are covered!